Last night, we went to dinner at Lou's House of Blues. Upstairs there was a rock quartet playing rock and blues. After a pretty nice dinner we tried to think of what else to do and where to get dessert. We left the restaurant down on the Wharf and started walking up toward the center of town and into the North Beach area. It started getting dark and we were beginning to get tired and cold, but we found a nice place squeezed into a small triangular building at the corner and across the street from Washington Square. The name of the place was Mario's Bohemian Cigar Store. They served pizzas and strombolis and sandwiches. But we just wanted some coffee and some dessert. So, we got cappuccino and a slice of chocolate cake. After a nice relaxing time, we headed back down to the hotel and relaxed for the rest of the evening. This morning we decided to get some cheap breakfast and pick up some sandwich meat and fixins' at the local grocery store. Combined with the sourdough buns and some apples, we had a cheap picnic lunch. 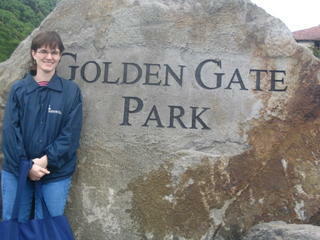 We grabbed the Muni--the local bus service and headed down to the Golden Gate Park. 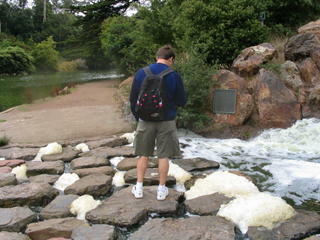 I don't really know why they call it Golden Gate Park, since you can't really see the bridge from the park, but whatever. We wandered through the park for the afternoon, looking at the nice trees, seeing flowers, watching families play. We ate our lunch beside a pond and just spent our time walking. You can see some of the pictures we took below. Here is a picture of me recording the audioblog that you can link to and hear in the post below this one. It was chilly and foggy--just like every other day that we have experienced here. 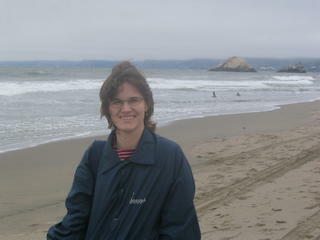 Here is Tegan taking a break from searching for sea shells. 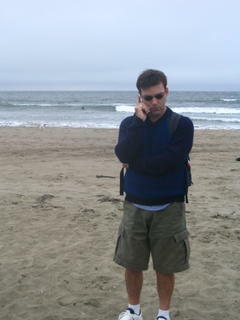 Apparently this part of the Pacific Coast didn't offer up any shells. We didn't find this particular lobster during our time on the beach. Rather it was one of the many whimsical bread shapes available at the Fisherman's Wharf bakery where we bought our bread this morning. Here we are preparing to enter . . . well, you know. 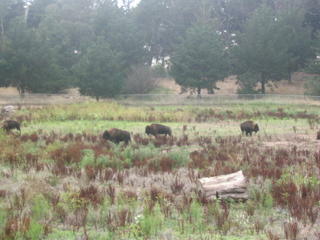 Did you know that there is a small herd of American bison inside the Golden Gate Park? Yep, there sure are. 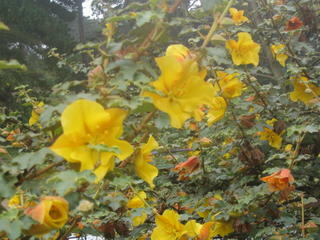 There are lots of pretty flowers around the park and there are also some nice lakes as well. I particularly liked this little creek that ran alongside one of the roads. It fed into Lloyd's Lake, named after the man that sponsored the creation of the park. The creek ran for several hundred yards and reminded me of the many camping trips that I took as a child. 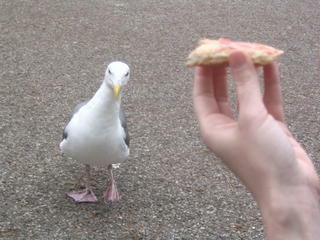 When we stopped to eat our picnic sandwiches, we attracted many pigeons and gulls(?) 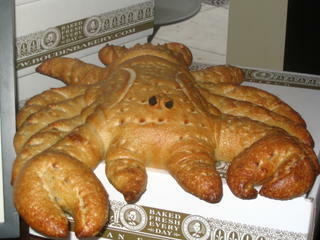 that clearly hoped that we would give them some scraps of the bread. This particular bird and many others were constantly moving in on us and bugging us. I didn't give them any of my food, but Tegan felt like being friendly. On the way home from the park, we took the Muni bus back to our hotel's neck of the woods. The bus route took us along Haight Street, which was the closest we got to Haight/Ashbury. I definitely felt a kind of groovy vibe, but maybe that was the extremely crowded conditions on the bus and my sweat. It was a good day. Tonight we will be having dinner at the restaurant beside the hotel. Tomorrow its a shift of scenery across the Bay and into new adventures.